Homemade jams sans preservatives is something i wanted to try for quite some time. Since the mangoes are in season, so i just prepared Homemade Mango Jam and voilà!.. It completely satisfied me. And i am sure, this homemade mango jam is a better treat than the ones available in the market loaded with preservatives. 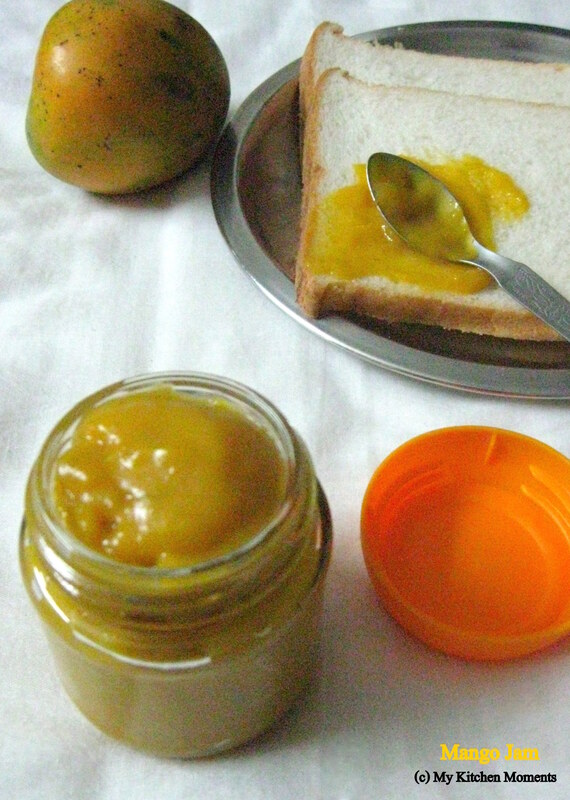 So enjoy this homemade mango jam as such to satisfy your sweet cravings or else, it is apt to go along with bread as a sandwich. Either way, it tastes just YUM!! Wash the mangoes and pat dry. Peel the mangoes and with a spoon, cube out the pulp and set aside. In a blender, place the ripe mango cubes, squeeze the lime juice and blend until it is slightly coarse and not too smooth. In a small pan or kadai, place the mango purée, add sugar and bring it to a rolling boil until the sugar dissolves. Once the sugar dissolves, keep the flame to medium inorder to avoid burning of mango pulp at the bottom of the pan. Keep stirring and cook for at-least 15-25 mins until the water mixture collects to form a jam consistency. The mixture will turn glossy at this stage. The jam has to be thick but easily spreadable. Switch off and remove from flame. The jam will thicken more when it cools down. Cool completely and store in a clean airtight sterilized container and refrigerate. If need be, just add few finely chopped ripe mango pieces and cardamom powder to the jam for extra flavor. But i kept it simple and relished with just the mango taste alone. It tastes delicious. Be careful in checking the consistency of the jam. Because when the jam cools down, it thickens further more. Choose a good quality ripe deep yellow mango variety. You can refrigerate the jam for a couple of weeks. Delicious idea, loved this. It is definitely much better than the rubbish we find at the supermarkets! I love mangoes, Would like to try sometime. Do try it out, you may like it!! Thank you Sarah 🙂 Do try it out, you may like it! 🙂 Sure dear. Right away!! Very true! 🙂 Thank you so much..